Two Egyptian art initiatives, one from Cairo and another from Alexandria, will exhibit work this month in the ninth edition of the Supermarket Art Fair in Stockholm, Sweden. Gudran for Art and Development, from Alexandria, will showcase two projects. The first is dedicated to its newest space, 'Wekalet Behna', set to open later this month. Once the office of Behna Films, one of Egypt's biggest cinema distributors from the 1930s to 1950s, the 12-room apartment has since been turned into both a museum about Behna's legacy and a platform for Alexandria's growing visual art and independent film scene. 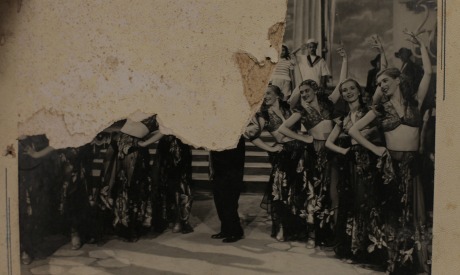 The exhibition in Stockholm will include damaged photographs from Wekalet Behna's archives that demonstrate how political change negatively impacted Egyptian art in the 1960s, when the film company was nationalised under the rule of then-president Gamal Abdel-Nasser and thus went into debt. The other Gudran entry to the art fair is a photography-inspired piece by one of the institute's founders, visual artist Aliaa El-Gready. The project, 'If Time were Liquid', features a series of photographs of well-known downtown Alexandria luminaries, with them staged in a manner that is at once antiquated yet contemporary, in essence a statement on how nostalgia functions in both our anticipations of the future and our understanding of the present. The photos will return to Alexandria after the art fair and be displayed throughout the Meditteranean city's public spaces, cafes, streets and markets. The second Egyptian initiative at the fair is Artellewa, a space in Giza that hosts exhibitions, events and art residencies. Also a part of Artwella's exhibition are paintings from Hana El-Degham, one of the first artists to exhibit in the space, and Samah El-Degham, who will present portraits of the various children that she has worked with in workshops at the venue in Giza. Another highlight from the Arab world is Syria's participation from the Damascus-based gallery, AllArtNow. Held in Stockholm's Kulturhuset (the House of Culture), Supermarket is Scandinavia's largest international art fair, featuring innovative artwork from 80 artist-run spaces in 30 countries.